Hakone is just 75 min away from central Tokyo Shinjuku. It's one of most famous onsen resorts in Japan. Get away from busy city life and relax in Hakone. Tokyo is a city that every district has a different face. Everyone should visit at least once in their lifetime. Approx. 100 min from central Tokyo, Shinjuku. Enjoy a precious views at the foot of Mt. Fuji. The Izu Peninsula is about 100 km southwest of Tokyo in Shizuoka Prefecture. It's can be reached by limited express train from Tokyo by 2 hours and popular sightseeing spots with rich nature. 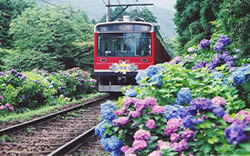 This package plan is including the resort express train "Super View Odoriko train"! It's a direct trip from Shinjuku station in Tokyo to Izu without transfer and it has a wide window to enjoy the view of coastline. Why book with Odakyu Travel? Japanese cypress wood bathtub at Female’s public open air hot spring area will be closed due to the repair works. Male hot spring area and Female hot spring area will be replaced by time zone. During the period, one day use service is not accept for male use and hotel guests who are not able to use Japanese cypress wood bathtub. Sorry for the inconvenience and thank you for your understanding.